Made from clear acrylic this mill is in the more familiar traditional mill design with a central spindle and threaded end cap. It has a hexagonal footprint with angled sides, tapering towards the middle of the mill. 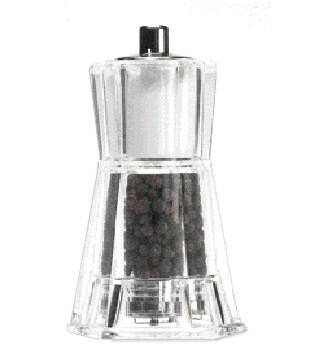 Ideal for people with a preference for low sodium or free running salt, its total height is 12 cm high (4¾ inches) and arrives prefilled with salt and black peppercorns.